To order a printed copy of the Bath & West Country Walks brochure, simply click the Request button below. Family run for the last 20 years Bath & West Country Walks specialise in beautiful guided and self-guided walking holidays in Bath, the Cotswolds, Exmoor, Somerset and Wiltshire. Additionally, they offer guided walking holidays in Austria and Cyprus in the Spring and Winter. Whether you are a new walker or a keen walker looking to discover a new part of the English countryside they offer a variety of Guided and Self Guided walks to suit everyone. Each holiday enables you to come into contact with nature, wildlife and local heritage. Overseas they visit Seefeld in Austria, one of the most popular destinations in the Tyrol. They walk in Austria in the spring when its meadows are filled with Alpine flowers and the mountains still capped with snow and in winter enjoy walking and snowshoeing. Their Cyprus holiday takes them to the Akamas Peninsula, the least developed frontier of Cyprus. It is ideal for walking in the spring and winter sunshine. 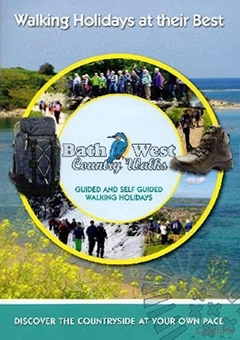 Order the 2019 Bath & West Country Walks brochure for beautiful guided and self-guided walks in the UK and Europe. By pressing the Request Printed Brochure button you give consent to Bath & West Country Walks (and their Data Processors for the specific purpose of delivering your literature) to send you their Brochure .